Guay Tiew Kua Gai or roasted chicken noodes is easy to make on the paper. Few ingredients, clear instructions, but still so difficult to get it right. Have you heard big chefs speaking about the importance of controlling the heat and time? Thats exactly what we are talking about here. A small mistake and you’re in the mediocre territory immediately. Suanmali does everything right. And they do it every time. It has been a favorite of mine for years. You should pay some attention to the word Kua (as in Guay Tiew Kua Gai) as it explains that the food is roasted, contrary to Pad as in Pad Thai which means stir-fried. So why should you do that? Well, to make this dish you use a wok, in other words the same tool as in stir-fried dishes. But here you let the food set to get that charcoal on the border to burned texture and flavor. That is roasting in a wok in the Thai language. It is a fantastic dish, and I don’t agree with those speaking about this as a sister of Pad See Ew, even if I understand why they say it. Why? Because both the texture and flavors are very different. Using some of the same ingredients doesn’t necessary make the two dishes comparable. The charkoel smokiness and the running egg yolk makes all the difference, both when it comes to taste and texture. It doesn’t have the slight oily texture as in Pad See Ew and the running egg yolk both taste different and give a complete different texture. I really like both Pad See Ew and Guay Tiew Kua Gai, but they are very different. To make roasted Chicken Noodles you use pork fat, pieces of marinated chicken, soy sauce, eggs, spring onion, white pepper and rice noodles. Some vendors also use garlic. Oyster sauce is sometimes used, but not here. Anyway, it always comes with fermented squid, mostly favored by asians. It is mainly added for the texture. When marinating the meat you use soy sauce, sugar and white pepper. White pepper can also be added when serving. Some vendors also use oyster sauce in their recipes, but to me that ruins the subtleness of the dish, changing it to something else. Anyway, you can normally order it with or without another egg on top. I suggest you order the extra egg. They crack it raw on top of your dish just before serving. The egg white will cook from the high temperature or when you mix the egg yolk with the rest of the dish. Add your preferred amount of roasted chili before mixing in the egg yolk. Chili and egg yolk is a fantastic combo, also when the chili is roasted instead of being stir-fried. It’s all served on top of some leaves of lettuce. On top, you add the chili sauce from the red bottle on the table. It is not very spicy, so don’t worry. The chicken will be very tasty and soft from the marinade, while the noodles are crispy on the outside and soft on the inside. Rice noodles are often mixed with tapioca flour in various ratio. The tapioca flour will give the noodles a more chewy texture, while rice flour gives a crispy texture when fried in hot oil. Guy Tiew skua Gai is made with 100% rice flour at the best spots. Suanmali is a true institution in Bangkok’s Chinatown. They have delivered quality day inn and day out. And I do find them a notch better than Ann Guay Tiew Kua Gai 30 meters away that also is an excellent spot for Guay Tiew Kua Gai. The reason for positioning Suanmali first is that the noodles are slightly more crispier at Suanmali. Ann Guay Tiew Kua Gai have the advantage of air-condition, but again, if taste and texture really matters, Suanmali is a slightly better spot. How to get there: Take the MRT to Hua Lamphong and walk towards Luang road. Be aware that a new and closer MRT station Wat Mangkon Kamalawat is supposed to open in September 2019. Anyway, when getting to Luang road, find the road cross to Yukon 2 road and walk into Yukol 2 road and then again take the first to the right (also named Yukon 2 Road) and walk 40 meters until the next street cross where you see Suan Mali on the corner. 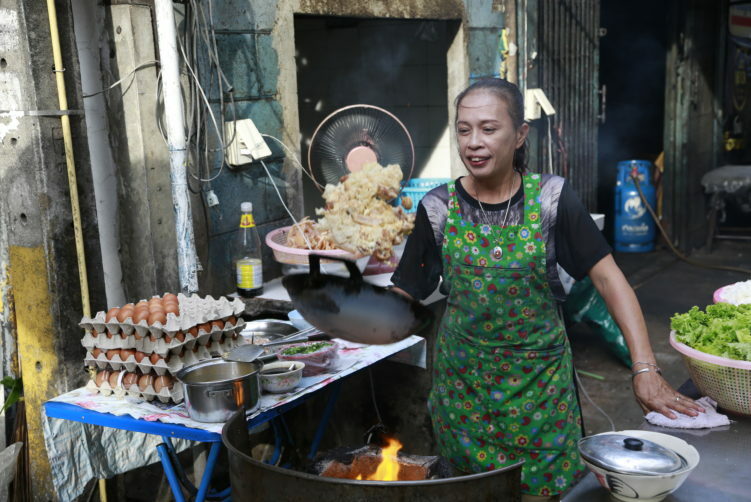 An easier option is to walk true Nong Ann restaurant (also known for their kuay teow kua gai) at 419 Luang road. You just walk through the restaurant into the alley behind the restaurant, where Ann makes their own food. Take left when getting out in the back of Ann and then walk the 20 meters until you reach the road cross where you find Suan Mali on the corner. Personally I don’t like to walk through a restaurant to get to another restaurant, but it certainly is the easiest way to find Suan Mali. 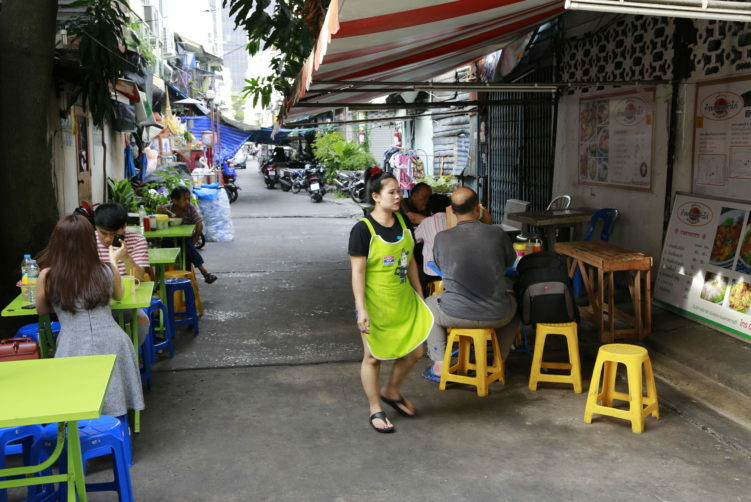 You can also walk into the alley at the corner of Nong Ann and then take the first alley to the left and continue towards the first corner where you find Suanmali on the right side – be aware that you will pass a few street food vendors on the 30 meter stretch before reaching the corner. Guay Tiew Kua Gai or roasted chicken noodes is easy to make on the paper. Few ingredients, clear instructions, but still so difficult to get it right. Have you heard big chefs speaking about the importance of controlling the heat and time. Thats exactly what we are talking about here. 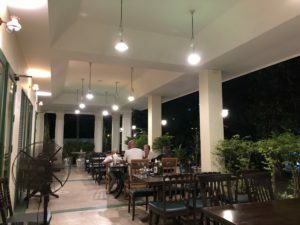 Suanmali is just a great spot for dining. See full review at StreetsideBangkok.